I’ve been to a lot of asian restaurants in the US and they almost always have numbers next to the different items on the menu. Every time I make the mistake of reading the name of the dish I want and then get chastised with “No, just say the number.” Every time. Maybe writing this post will get me to finally change. There’s actually an app for that. “Word Lens” or some such. Seriously. I for one don’t trust machine translation except to get the most bare-bones sense of something – and even that’s liable to screw up with idiomatic use or slang. Mostly I use Google Translate as a fancy dictionary. okay, lets use google translate on your comment. Unless you get the most minimal sense of something, I do not trust the machine translation of either – well, it is easy to use conventional or spoiled by slang. I have used Google as a dictionary translation mainly flashy. What they don’t wanna let on is the waitstaff (in LA, it’s all actors, dancers, and screenwriters waiting for their break- seriously!) don’t speak the language well (if at all) either. They’re hoping they can just get the number and pass it on to the kitchen, ’cause they’re NOT gonna be able to correct your pronunciation! There is an asian restaurant quite close to where I live, but the meals are called exactly what they are, like chicken soup, three small meals, etc… but in Swedish. 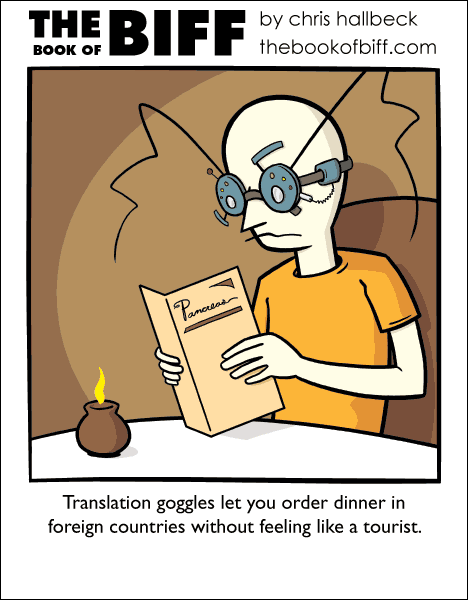 I don’t know if it is like this at other asian restaurants in Sweden, though. When it comes to machine translations, I’ve just recently discovered that you can click a button to make a voice read out loud what you’ve typed in at Google Translate, and I find this hilarious! I also like to translate the text back and forth, so it ends up looking like gibberish. I used another translator before (called Lexikon24), but it got glitched up, so you couldn’t write any more than a half row of text, and this is why I didn’t discover Google Translate until now. Mmm, another fan of Pancreas. Great restaurant. There are no Babel Fish for the eyes. Although, sticking small, yellow, leechlike fish one one’s eyeballs is right up Biff’s alley. I just point at the menu. For some restaurants even translation won’t help. We had a great Dim Sum place here that had English translations on the menu. Taro Pies, Turnip Cakes, Rice Flour Tubes w/ Dried Shrimps, Coconut Cake (turned out to be jello), Shrimp Pies, Crispy Fish Balls. I made a spread sheet to keep track of what things were and whether we liked them. by best experience was once in Italy, the waiter brought us an English menu along with the Italian one, to be more helpful. As it turns out, it was easier to understand the Italian menu. Through a bit of interpretation and looking at what was actually on the pizza when it arrived, we learned what most of the things on the English menu were. “Peppers to the irons” for example, was grilled peppers. However we never did find out what the “flakes of nuisance” were. i dunno, i thought we were all just making food-related references to stuff. Alternatively, you could actually learn the language before you travel.